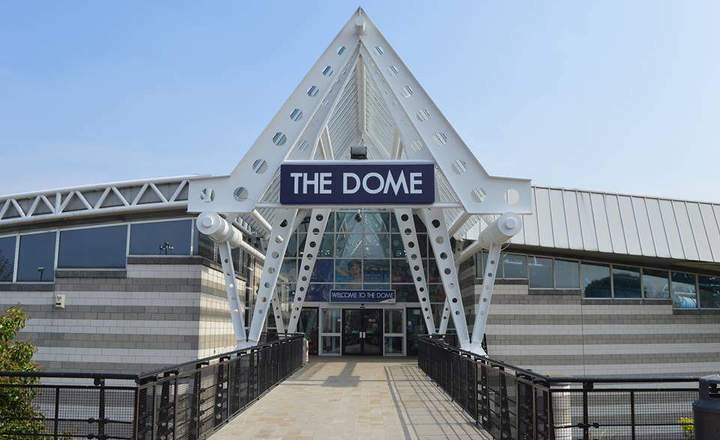 I remember the Dome being built…eek! 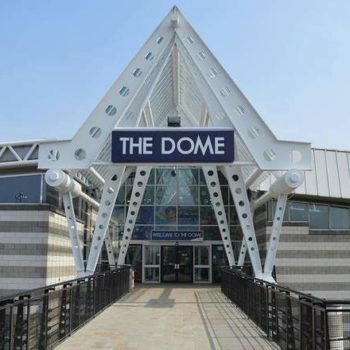 It’s now firmly well established as one of Doncaster’s top visitor attractions, as well as being one of the UK’s top 5 Sports and Leisure attractions and we are lucky to have it on our doorstep. Having said that, the last time we had a dip in the pool was a couple of years ago (I don’t know why?!) and the last time I stepped foot on the ice rink was probably in my teens!! So, last weekend I announced to my mini Mumblers that we were going to go to the Dome. This magical place that they drive past literally all the time, but although they have a vague recollection that they have been inside, we haven’t since they were about 5 and 2! 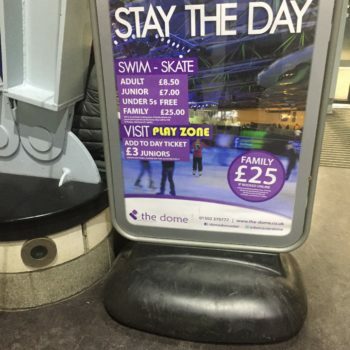 The Dome have a great family pass, which allows a family of four to Swim & Ice Skate on the same day for £25 when booking online (a saving of £5 compared to booking when you get there). 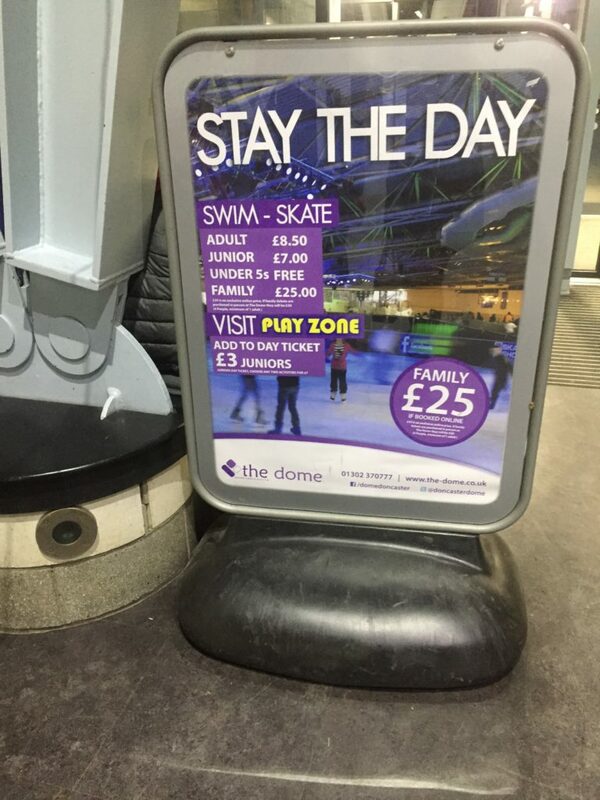 A family ticket for swimming alone is £20, so to have a skate too for an extra £5 is great value). With our bags packed (we had so much stuff as I had packed swimming gear, plus hats, gloves and scarves…I know the skating is inside but it seemed right) we set off and the excitement levels were high! 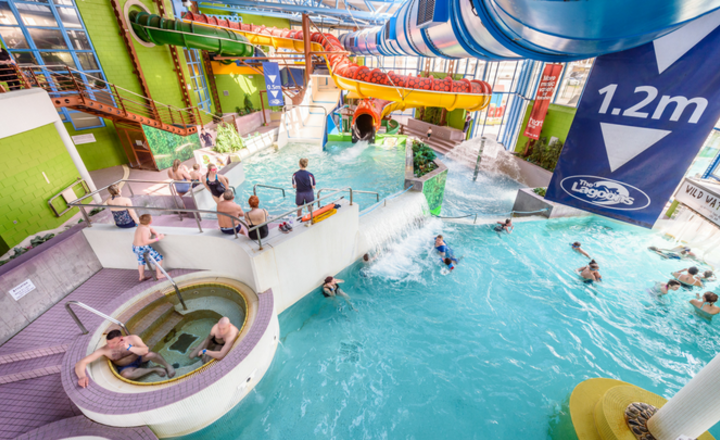 Swimming in the Lagoons (7 pools altogether) is great fun for all of the family, whether you have toddlers, tweens or teens. We went on a Saturday, during the Big Splash Session. 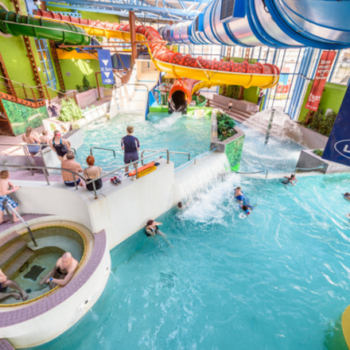 There are big slides, including the twisty serpent and blackhole (height restrictions apply), plus a family slide and the falls, together with a smaller shallow ‘paddling’ area for little ones which has a little climbing frame and small plastic toddler slide. I was pleased to see that the Dome changing rooms have had a bit of a refurbishment. The changing room layout has been changed a bit since our last visit and improvements have been made. On walking down the stairs, I seem to remember it being more open previously, whereas now it is sectioned off, which I think makes it less draughty and we didn’t feel cold. There is one route past a dedicated baby changing area (larger changing rooms with changing tables and a changing places toilet), so brilliant for parents with babies and toddlers. One of the most stressful things about swimming as a family can be the whole ‘changing’ experience, my husband dreads it. Changing rooms at any swimming pool are going to be wet, no way around this…the toilets are going to be wet as people are in and out in swimming costumes etc. It’s a wet place and combined with children it can make for a difficult experience if you’re trying to organise yourself and them. I’ve experienced clothes falling in to little pools of water, whilst cramped in a small space trying to change, whilst finding a drink or snack for a hungry child..we’ve all been there. Overall I thought the changing areas were clean and there were people sweeping the area whilst we were there, both before we got in to the pool and when we got out. This time around we were organised…myself and the kids had costumes on underneath our clothes so it was a quick change and ready! Saturday is obviously one of the busiest days of the week, but we found two cubicles – there were some slightly larger one’s which are useful if you’re on your own for example with two children. We then got ourselves a couple of lockers. Top tip for a family would be to remember to take a couple of £1 coins. With all of our stuff we needed two lockers and had a brief moment where I thought I only had £1 and we were never going to fit everything in…even in a large locker! So make it easier for yourself, take plenty of coins (you get it back after you’re finished). My children were so excited to get in to the pool and spent the first ten minutes or so chilling out on the ‘bubbly beds’ in the middle pool. My son, who has literally just gotten used to being in the water after many attempts, took no time at all getting in and splashing about. We braved the outside rapids, which are accessible from the the main pool area, no need to get out of the water. It was quieter outside and we were floating on our backs around the big rock together. My daughter couldn’t get enough of this..felt like we were at a mini spa as the water was so warm and steam was rising as it was freezing outside. The big slides look brilliant, however neither of my children wanted to go down them, my youngest would have been a bit little anyhow as you need to be 1.2 meters tall. They look fabulous fun though! 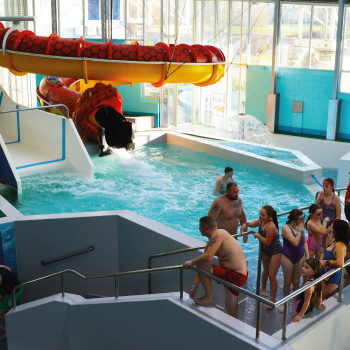 They built up courage to go down the falls which connects the larger, deeper pool and the middle pool area though. We spent a lot of time doing this and I managed to get a bit of proper swimming done with my daughter in the deeper pool too. My son, who can’t swim yet, loved the kids area, and enjoyed moving around on his belly pretending he was swimming! It was the perfect depth for him. There were lots of water fountains and he enjoyed the climbing frame and little slide. I’d say we were in the pool for over an hour and had to coax the kids out of the pool with a promise of ice cream! They would have stayed in longer. We really enjoyed it. There are plenty of showers, including the separate showers near the baby changing area and there were hair dryers to use (proper hairdryers, not the sort that you have to hold your finger on the button all of the time to make it work). Following our swim, we sat in the cafe and had hot dogs and ice cream, whilst waiting for the family disco session to begin on the ice rink. On to the Family Disco! This session runs from 4.30pm-6.00pm on Saturday. 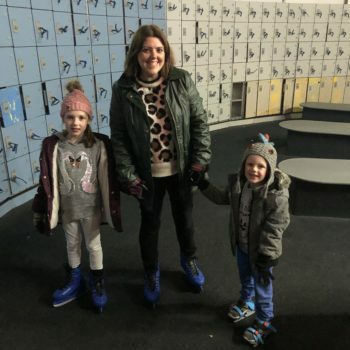 This was included in the family pass, however if you just want to go skating, this session is priced at £3.70 for adults and juniors, with under 5’s free. A big benefit of the family pass, is that you can queue jump, which saved us a lot of time as the queue was huge! 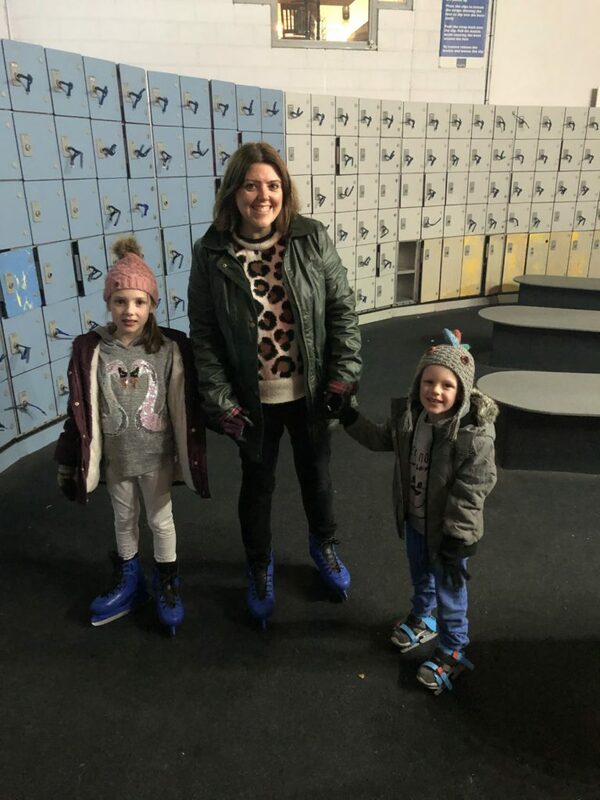 Skate hire is included, however the penguins are chargeable at £3 per half hour whether you have a family pass or paying by the session. 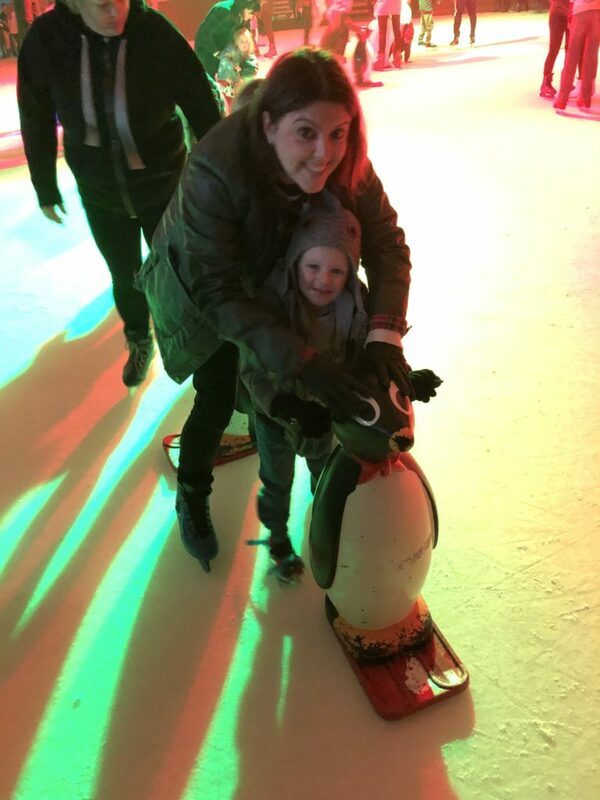 If you think that your little one will need a penguin, you have to mention it and pay for it at the reception upstairs, before heading down to the ice rink. They will give you a ticket to present when you get your skates and give you the penguin. We put all of our bags into the lockers..again you’ll need a couple if you’ve a lot of bags/coats, so have coins ready. Mr Mumbler decided to sit this one out, so I took each of the kids in turn on to the ice. It is possible for spectators to stand by the side of the rink though. The Dome has a split level ice rink…I used to zoom up and down the ramps…not any more! My 7 year old and I built up confidence to go down the ramp, holding on to the side and coming up was harder than I remembered but we did it. My daughter loved the disco element, flashing lights, music etc and loved skating. My son used a penguin and was a bit more apprehensive. He was still able to wear the skates that fit over a shoe, so they were a bit more sturdy and I had to help him move around. The nice thing about this session was that there was a mix of ages and lots of people were of the same ability as us. There were lots of little one’s with penguins and it felt quite safe. I wasn’t too worried about the kids getting knocked over. We definitely weren’t the only ones hanging on to the side. We spent a full afternoon at the Dome, but left thinking that we could have squeezed in the Playzone in between swimming and skating, had we given ourselves a bit more time. The Playzone is for 0-12 year olds and we could have had a coffee/food in there whilst the kids played. One thing to remember for next time! Overall, we really enjoyed our day and had a lot of fun, great family time and i’d say that the family pass is great value. If you have little ones, the best bet during the week is to go in the morning. “I went in an afternoon and had to use the adult pool which is quite deep and I didn’t feel safe holding my baby” CG FB February 2019. The Children’s Pool is closed during the hours of 1pm-4pm. There is a parent & toddler session between 10am-1pm, Monday to Friday and then the Children’s Pool opens again at 4pm to 7pm. “We have gone down the family slides since my 2 were 1 & 3 years old (ish) with arm bands on then. They are now 4 & 6 years old and happy to go down without the arm bands. We (grown-ups) tend to slide down first (when we can) so we can catch them. 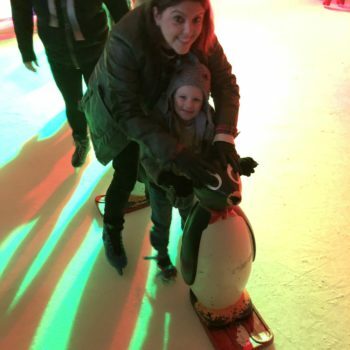 We also went ice skating recently, kids love it. Small moan, lockers are not the best size…and it ended ‘abruptly’ in my daughters opinion…not a deal breaker” LL, FB February 2019.